Photo courtesy of glue&glitter at Flickr.com. Composting doesn’t require a big back yard… or even a backyard at all. There are several types of composter that can be used indoors, and are perfect if you have a postage stamp sized yard or live in an apartment. These composters work through one of two methods – they’re either aerobic, or anaerobic. An aerobic composter uses bacteria that consume oxygen. These bacteria are “more advanced” than anaerobic bacteria, in the sense that they can outcompete anaerobic bacteria as long as they have oxygen to work with. Oxygen acts like an accelerant – it allows aerobic bacteria to breed faster, break down organic molecules faster, and generate more energy. What this all means is that aerobic composters can work very quickly. But, aerobic bacteria can quickly use up all the available oxygen and die off. The key to an aerobic composter is good ventilation. 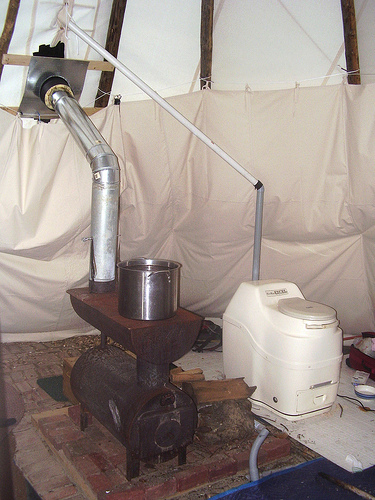 Aerobic composters, such as the Nature Mill Indoor Composter, require mechanical help to inject fresh air. Compost naturally tries to settle into lumps, and these lumps are not very permeable to oxygen. With a tumbling screw to break up the clumps, and an air pump to bring in fresh oxygen, the Automatic Countertop Composter makes sure that aerobic bacteria have everything that they need. The filtering system keeps smells to a minimum and actively eliminates odor. Anaerobic composters are also available. These composters work without oxygen, and odor isn’t a concern for them because they’re airtight. 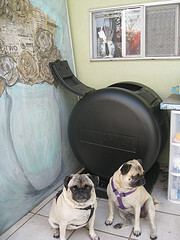 Composters like the Indoor Kitchen Composter rely on the bacteria found in Bokashi. Bokashi is a Japanese term that describes a mix of bacteria in a growth medium (usually rice hulls or saw dust mixed with molasses, corn syrup, or sorghum). Each time that new waste is added to the bin, it’s important to add a new layer of Bokashi on top. Anaerobic composters will break down the compost at a microscopic level, but they require the help of aerobic bacteria to complete the process. After the composter fills up with partially digested waste, it’s important to bury the compost outside in a small trench, or in a pot full of healthy soil. This final stage will happen very quickly (anywhere from 3 days to 2 weeks depending on temperature and soil conditions), and will not produce much odor. Both aerobic and anaerobic composters will get the job done. 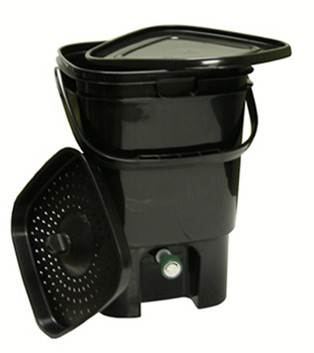 If you want faster results and don’t mind the noise of a pump or mechanical screw, then the Nature Mill Composter is a better bet. 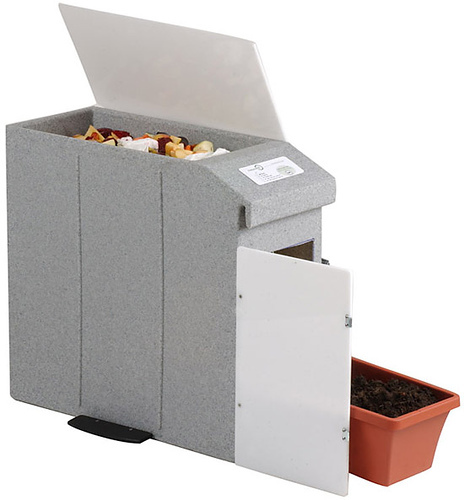 If you want a less expensive model and prefer your compost to be out of sight, odor-free, and silent, then a Bokashi Composter is the right one for you. Photo courtesy of goforgr33n at Flickr.com. Photo courtesy of London Permaculture at Flickr.com. Everybody poops. But few people use their poop to help around the garden. Most of our waste is carried away by sewage pipes and ends up far, far away. The thing is, waste contains tons of nutrients that plants love. It doesn’t make much sense to flush away fertilizer, and then spend money buying bags from the garden supply store. Toilets usually use more water than any other appliance in the home, and transporting sewage consumes a lot of energy. Most of that electricity comes from polluting sources like coal and natural gas. So, flushing the toilet wastes water resources and adds to our carbon footprint. There is a better solution. Composting toilets are available that convert waste into fertilizer. Toilet Composters are safe, sanitary, and easy to operate. Composting toilets are also known as biological toilets, waterless toilets, and dry toilets. These toilets come in many different designs, but they all do basically the same thing: they use naturally occurring bacteria to turn excrement into soil. 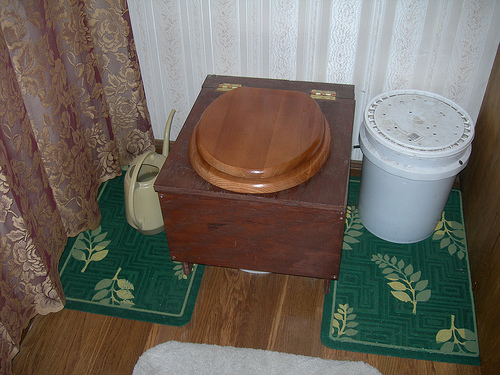 Human waste is very high in nitrogen, so a green toilet usually requires additional carbon to ensure proper composting. Toilet paper provides some carbon, but sawdust and leaves may also needed for balanced compost (and they can help control odors too). Composting toilets work very much like other composters. They don’t fill up as quickly as you might think, because bacteria actively break down the contents into heat, gas, and compact soil. Given time, the contents of composter toilets will shrink to a fraction of their size. In general, human waste will reduce to 2-10% of its volume when converted into compost. This means that composting toilets are well suited for gradual use over an extended period (such as in a hunting cabin, RV, or single person home), but they may not be the best plumbing option for a family reunion or large BBQ. Photo courtesy of sheagunther at Flickr.com.